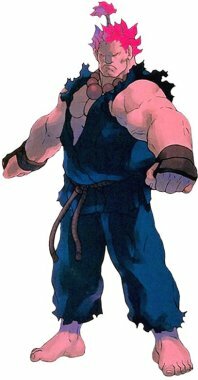 Akuma, rather surprisingly, appears only in the first Street Fighter EX tournament. It is unknown exactly what transpired during the tournament, but two events are rumored. Already aware of Ryu's capacity to tap into the Satsui no Hadou (or "Surge of Killing Intent"), he may have been drawn to the tournament to witness Ryu's progress in either accepting the murderous intent, or rejecting it. However, once he arrived, another fighter may have intrigued Akuma more than Ryu. Kairi was another martial artist who showed the same level of capacity for Satsui no Hadou as Ryu, but with the potential to twist it for the purposes of life instead of death. Before finding Kairi, he stalked Ryu until Ryu was alone. He approached Ryu and examined him. Ryu demanded to know what he wanted. Akuma, a little disgusted with what he sensed, simply stated that he was the man who killed Ryu's master, and Ryu was not ready to fight him. Ryu's eyes opened wide, but Akuma did not remain. Just as Akuma left, M. Bison approached Ryu and prevented Ryu from following Akuma. Akuma finally tracked down Kairi. A man with a sword was rushing towards him. Not wanting to be interrupted, he warped to the location in front of the swordsman and instantly knocked him out with one blow. When Akuma initiated a battle with Kairi, Kairi was beaten within an inch of his life, and lost the use of one eye when Akuma grazed his face with a Shoryuken. Just as Akuma was about to finish Kairi off, Kairi retaliated with a burst of power that was beyond his control, which actually succeeding in stunning Akuma, before Kairi disappeared from the fight.